Wondering how to take your phone with you when you run? Do your jogging pants have pockets for your cash? 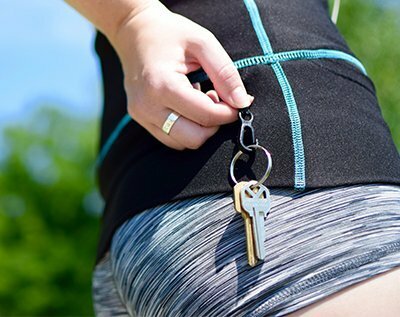 Running is a fun way to keep a fit body — but how can you take your valuables with you? Carry them in a pouch while you run? That would be inconvenient. It is built with durable materials to secure a tight fit. It has pockets where you can place your things and carry them with you. Some come with water bottles to help you keep hydrated. Others simply come with pockets, sometimes expandable, so you have the freedom to bring small things. Tired of choosing from hundreds of running belts in stores? Here’s a good one: the PakRat Running Belt. The PakRat Running Belt is made of high-quality fabric that is breathable and dries quickly. It stays cool and keeps you comfortable even while running. It has a fold-over security flap to keep your things secure and prevent them from bouncing as you move. This feature makes it easy to use. Simply load in your things and fold it down to lock them in place. It also comes with a hidden key clip. You can put more things in PakRat Running Belt. It has three large pockets. Front pocket can easily accommodate larger phones, like iPhone 8 plus with a case. And if you still haven’t got wireless earphones, you can also listen to music with its convenient opening for earphone cord. And for storage, you can place your earphones in either pack pocket. To keep you visible in dark conditions, it comes with a reflective 3M logo. It reflects light when it is dark outside, so you stay visible under any circumstances. No bounce, comfy fit, and ample storage. The PakRat Running Belt comes with a 1-year warranty. It is made in the US so it guarantees high-quality materials and construction. You can use it in other outdoor activities aside from running, such as travel, hiking, biking, walking the dogs, nursing the baby, music fests, and sightseeing. There’s a lot that you can do with the PakRat! The PakRat is intended for both men and women. It comes in a wide variety of sizes so it can fit many waist sizes. Which size is right for me? Take a look at the chart to help you find the correct size. If you still can’t decide, then get the size that you typically wear with pants. If you are between two sizes, choose the smaller size. Step into your belt logo side front. Lift the security flap up. Now you´ll find the largest pocket which is in the front. It’s like a sweatshirt pocket so you can access it from both sides. The front pocket is the place to keep cell phone and other necessities, like cash/credit cards and running gels. The best place to keep your credit card and cash are against the side seam. In the back, there are two smaller pockets for smaller items. The right-hand back pocket has a key clip for added protection. When you have packed your stuff, fold the flip down so that everything stays in place. You can wear your belt over or under your shirt. In addition to the many features here is a list of pros and cons, and it comes with more pros than cons. 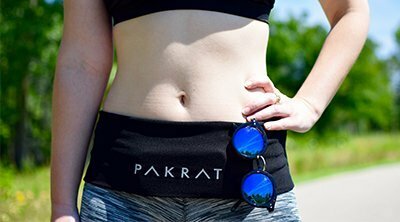 The PakRat Running Belt is a very functional and comfortable running belt. It can hold many things like money, cellphone, keys, cards, etc. in its 3 large pockets. It is easy to use; simply wear it around your waist, load in your things, and fold it over to secure them. You can also place your earphones in any part of this running belt. The PakRat also keeps you visible in dark conditions with its 3M logo that reflects bright light after sunset or before dawn. It comes in different sizes intended for men and women. One tip though: When choosing the size, choose one size down, especially if you intend it for running. You can also use it for other outdoor activities to keep your hands free. Another kind of running belt similar to the PakRat Running Belt is the Limber Stretch Hip Hug Flash Running Fuel Belt. It is wider and has a larger storage area than the PakRat. However, Hip Hug has a tendency to slide from the waist. The PakRat stays in place and keeps the load tight without bouncing or loosening. Yeah, it does the job, and I never have worries that my phone or keys will be misplaced.